U.S. Polyphenylsulfone Market « Global Market Insights, Inc. 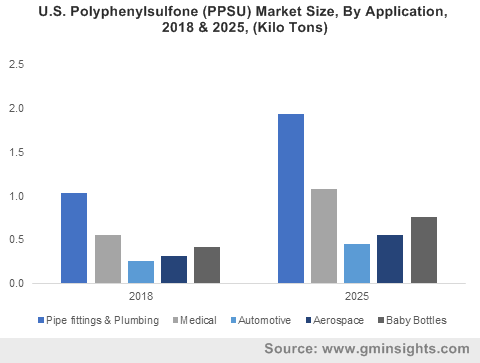 The popularity of the global polyphenylsulfone market has grown considerably in the past few years, with the proliferating application of the product in the medical, automotive and aerospace sectors. It would not be incorrect to state that polyphenylsulfone, owing to its resilience to high-temperature and corrosive chemicals holds commendable significance in the medical industry. An ideal material for clinical applications, polyphenylsulfone is highly resistant to hospital disinfectants. The increasing government expenditure to improve hygiene conditions in hospitals has propelled the demand for patient-centric, clean medical devices, in turn supplementing the polyphenylsulfone market growth. Technological advancements in diagnosis methods, imaging technology in orthopedic surgery and introduction of new products is also likely to boost the industry growth. The growing awareness regarding disease transmission through surgical devices along with government regulations mandated to ensure safety in surgical procedures and instruments are expected to surge the demand for PPSU from clinical device manufacturing companies. Indeed, the material is widely used in the manufacturing of medical tool handles, forceps, scissors, and clamps for several surgical disciplines owing to its enhanced sterilization resistance. Complex surgical tools like endoscopic probe positioning ferrules are also made using PPSU rods, which may further augment the industry growth. Recent reports from Global Market Insights, Inc., cite that the rod-based PPSU market share exceeded around $95 million in 2018. How will the aerospace sector prove to be a lucrative investment avenue for the global PPSU industry? Nowadays, aerospace engineers and aircraft manufacturers are constantly focus on reducing aircraft weight to lower fuel consumption and match stringent emission standards. Being up to ten times lighter than metal, polymer and composite materials like PPSU effectively meet manufacturers’ expectations whilst lowering cost by replacing expensive steel components. In addition to weight reduction, PPSU also adds value for many aerospace applications due to its unique properties like superior corrosion & fatigue resistance, tensile strength, and durability which significantly helps outperform metal components. The material’s high-performance thermoplastics property also helps meet stringent FST (flame, smoke, and toxicity), formulating its use in aircraft interiors while being in compliance with stern FAA regulations, further offering increased passenger safety. This would, in consequence, majorly impel PPSU industry trends from aerospace applications. The global polyphenylsulfone market is also touted to procure substantial gains from the automotive sector, owing to surging fuel prices, rising environmental concerns pertaining to automobile CO2 emissions, and increasing demand for lightweight, fuel-efficient vehicles. Undeniably, PPSU offers high strength and lightweight properties and is resilient to high-temperature engine oils and vehicular impact, making its deployment vital to increase and match vehicle safety and performance standards. The material is increasingly used for making engine water pump impellers, electric circuit/component insulators, automotive lights and more, effectively replacing heavy metal components and further reducing vehicle weight. This would lead to improved fuel-efficiency, the core of what global automakers are intending to accomplish as on today, which would quite overtly augment the overall polyphenylsulfone industry share from automotive applications in the years ahead. The mention of Germany is undoubtedly discernible when speaking of automotive applications. The region boasts of the presence of globally renowned car manufacturers like Volkswagen, Mercedes-Benz, BMW, Audi and more and houses one of the world’s leading automotive manufacturing infrastructure and highly qualified workforce. According to reports, the total number of passenger vehicles registered in Germany for road use was increased by 1.5% to around 46.5 million cars in 2018. Moreover, stringent regulatory measures by the European Union regarding carbon emission from vehicles has further encouraged automakers to adopt metal replacing material like PPSU to reduce vehicle weight and emission. It is also anticipated that rising technological trends in the automotive sector for vehicles that offer increased fuel-efficiency may contribute towards regional industry growth. Germany PPSU industry has also gained traction lately on account of the product’s usage in medical applications. Indeed, Germany polyphenylsulfone market size from medical applications is expected to surpass close to USD 8 million by 2025, driven by the enforcement of strict norms by the European Union pertaining to medical devices. A high-performance thermoplastic known for its high flexural, toughness, and tensile strength, excellent hydrolytic stability and resistance to heat and chemicals, polyphenylsulfone is touted to be the most ideal alternative for products that are inclusive of polycarbonate and polyamide. According to Global Market Insights, Inc, the polyphenylsulfone market size is set to exceed $500 million by 2025. This entry was posted in Polymers and Advanced Materials and tagged APAC Polyphenylsulfone Market, Europe Polyphenylsulfone Market, PESU, Pipe Fittings & Plumbing PPSU, Polyphenylsulfone (PPSU) Market, Polyphenylsulfone Industry, Polyphenylsulfone Market, Polyphenylsulfone Market Analysis, Polyphenylsulfone Market forecast, Polyphenylsulfone Market growth, Polyphenylsulfone Market outlook, Polyphenylsulfone Market PDF, Polyphenylsulfone Market report, Polyphenylsulfone Market share, Polyphenylsulfone Market size, Polyphenylsulfone Market statistics, Polyphenylsulfone Market trends, PPSU Industry, PPSU Market, PSu, U.S. Polyphenylsulfone Market.